The flag was adopted October 9, 1962. 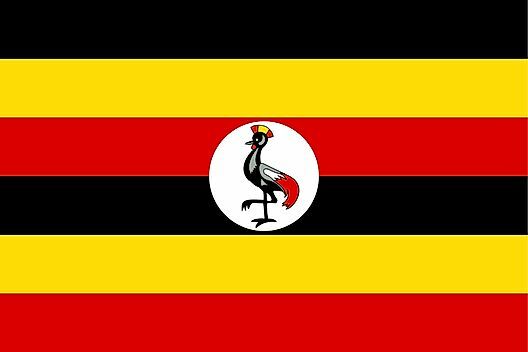 The flag's colors: black, yellow and red, represent the Ugandan people, sunlight and brotherhood. The centered "Great Crested Crane" is the country's national badge (symbol). 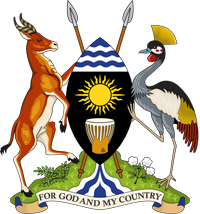 Uganda's coat of arms features a Crested Crane and a Ugandan Kob supporting a shield that displays three symbols: waves for Lake Victoria at the top, a sun representing the beautiful weather centered, and a traditional drum symbolic of dancing at the bottom. Crossed behind the shield are spears, and the national motto is displayed on a ribbon below.